The iPhone and iPad versions of Rovio’s Bad Piggies of the game can be downloaded for free. 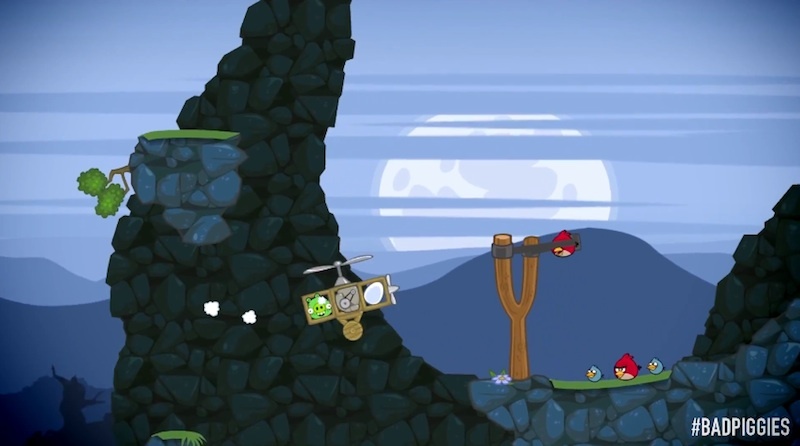 The gameplay of Bad Piggies is different from that of other Rovio titles like Angry Birds and its spinoffs, centering on contraption building and sandbox gameplay as opposed to the slingshot physics gameplay found in the other titles. The game also changes the roles found in the original Angry Birds by making the player control the enemy pigs as opposed to the birds, with the pigs aiming to capture their eggs after being stranded on a desert island. Earlier this year, both Angry Birds Space and Rio were named App of the Week, also resulting in a free sale. Update: Bad Piggies has now been confirmed as Apple's App of the Week. Am I the only one who stopped liking Angry Birds after the first game? Maybe not, I started hating The Bold & The Beautiful after Taylor died, the first time. Yeah, I got tired of Angry Birds after Rio. It's really depressing that Apple has chosen to make practically every Angry Birds game App of the Week since it started. But then I kinda understand that developers don't want to basically give their entire revenue away from letting them do so. Bad Piggies is okay. My brother and I got fed up with it pretty quickly. It's too complicated. This game gets impossibly hard after about 35 levels. I just quit when I couldn't beat any levels without a hint.